Setup shopping cart price rules for each store view to offer different promotions for customers from various markets. Based on customer insights from each store view, store owners always want to offer various incentives or discounts to encourage them to purchase products. However, default Magento just allows applying shopping cart price rules for the whole website, which means that all customers from all store views can receive the same promotion. What should we do? Let’s explore such a useful solution to make it easier than we thought: Shopping Cart Price Rule per Store View. When creating a new rule, administrators can select each store view as a condition to apply on the frontend. 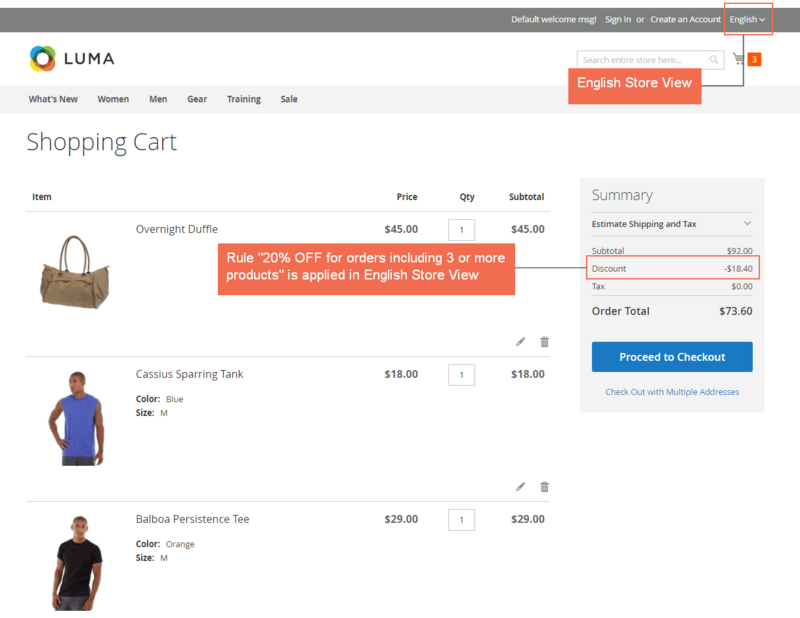 When customers purchase products on this chosen store view, they can get a different discount from those on other store views. The extension adds store views for administrators to easily select and set up condition for this rule. Also, they can choose multiple store views to set up a rule. 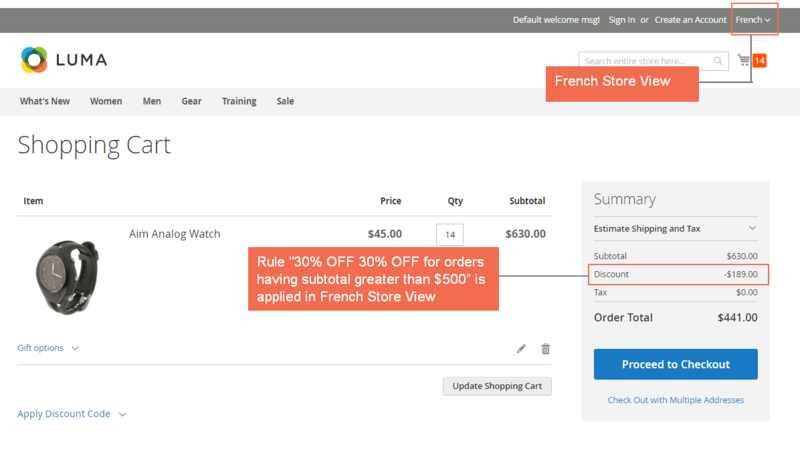 For example, a cart price rule can be set up to apply for both English and French store view at once. Multiple Store View Pricing helps to set up different prices and special prices of products per store view. Therefore, when combining with Shopping Cart Price Rule per Store View, store owners can have better pricing as well as promotion strategies for suitable local market corresponding to each store views. Are you ready to try this smart solution? Your extension is so cool! Now I can run different promotions in different store views. Also thank for your support. They help install and set up some rules for me. I feel very satisfied. Work exactly as it is. No more configuration, just set up rules like default. Quick installation and excellent support. Extension runs very well. also good support team help me so much when I want. Good job!